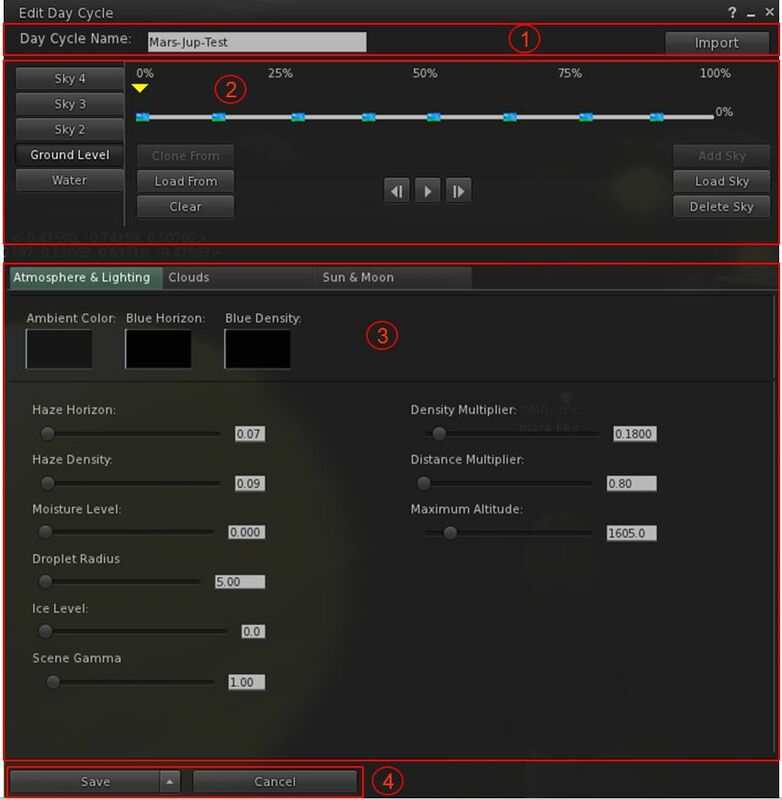 This section, using the Day Cycle controls and options to create complete day / night cycles, including different settings defined by altitude. Comprises a water track and up to four unique sky tracks. The water track comprises one Water asset. Each sky track is defined by altitude at the region / estate level – see Region and Parcel Controls. A defined sky track comprises at least one Sky asset. Can be a minimum of four hours in length (a default SL cycle) can be any length up to 168 hours. This means it is possible to have a single day cycle lasting up to 168 hours in length, or create a cycle of 7×24 hours days, or create almost any custom day / night cycle you want. Day lengths and offsets are defined at the region / parcel level – see Region and Parcel Controls. Can be offset from GMT by an number of hours – so the day / night cycle could, for example, be off-set to coincide with your own physical world time zone, if using a 24-hour cycle. Time offsets are defined at the region / parcel level – see Region and Parcel Controls. The relevant edit floater will open (Sky, Water, Day Cycle. As this section of the tutorial is about Day Cycles, the Edit Day Cycle floater is described here. Name field: displays the name of the Day Cycle you are currently editing. The Track Editor: this is used to define the tracks used in a Day Cycle, and ins described in The Track Editor, below. The Fixed Environment – Water options described in The Fixed Environment Floater – Water. These tabs are used to define the settings within individual assets (Sky or Water) used in a track. The Save / Apply and Cancel buttons. This section of the Day Cycle panel is used to define your day cycle: the sky and water settings that are used, at what altitudes (sky only, with a caveat – see below) and how settings are played and blended. It comprises the five elements, all of which are used together. The Track Editor comprising: 1. Track tabs; 2. The track timeline editor; 3. The track option buttons; 4. Playback Buttons. Located to the left of the track editor, these define the specific track you are editing. As noted above, a day cycle can have one water track and up to 4 sky tracks (Ground and Sky 2 through 4), depending on your own needs. Water only applies to Linden water, and will set the environment edit section in the middle of the Day Cycle Panel to display the water edit options. How to use these is defined in the section Fixed Environment – Water. The Sky tracks set the environment edit section in the middle of the Day Cycle panel to display the Atmosphere & Lighting, Clouds and Sun & Moon tabs. 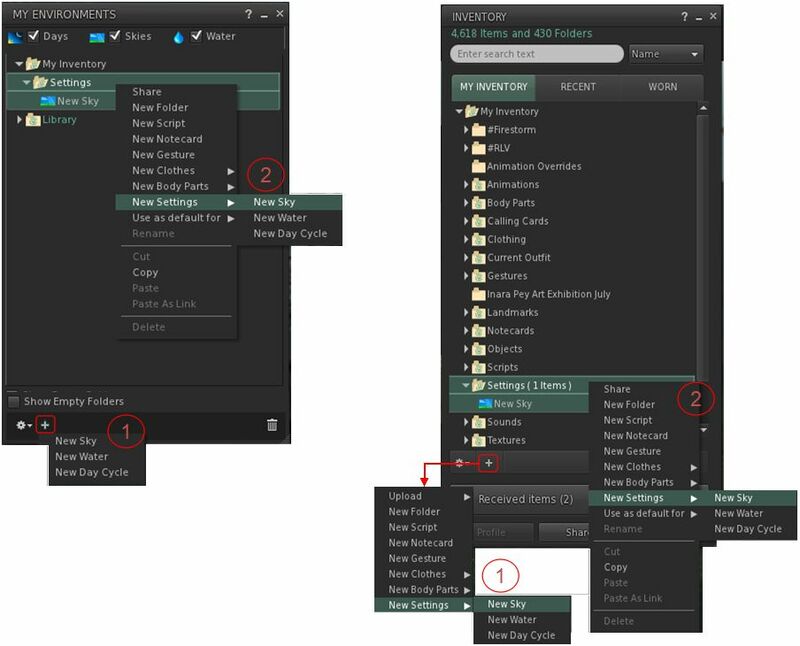 How to use these is defined in the section Fix Environment Editor – Sky. At a minimum, a day cycle will use the water and ground tracks. These can use custom environment settings for the water / sky, or the Second Life default settings. The Sky 2 – Sky 4 tracks need only be used if specific environments are to be set. The specific altitudes at which the Sky 2 – Sky 4 tracks are applied are defined at region level – see Region and Parcel Controls. Clicking on a specific tab (e.g. 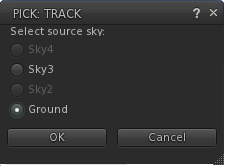 Ground) selects that track for editing using the track timeline editor and environment edit functions. Perhaps the best way to consider a track is as a timeline, charting the state of the water or sky through the length of a day. This timeline is indicated by the white line running across the top of the track editor. The percentage markers can be used to help determine specific points in the length of day. For example, if the length of day is set to 24 hours, then 0%/100% would equate to midnight; 50% to midday and 25% and 75% to 6:00am and 6:00pm respectively. For details on setting the length of day, see Region and Parcel Controls. A yellow pointer indicates the current point in the track that will be subject to any edits. This pointer can be left-click dragged forwards and backwards along the timeline as required. If the pointer is directly over a frame, the settings for that frame will be available for edit in the environment edit area below the track editor. Along the timeline for a track can be a number of indicators – frames – marking specific points in the track. Individual frames are indicated by a blue marker – a drop of water in the case of the water track, sky boxes for the sky tracks. Each frame in a track represents a specific point in time along that track, and contains a specific set of environment settings defining how the water or sky look at that point in the track. 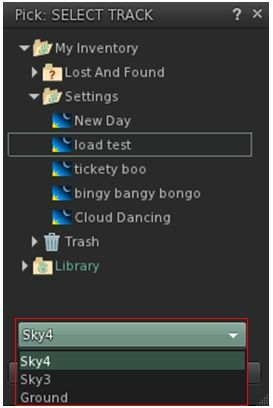 If the frame is in a sky track, the environment edit area will display the Atmosphere and Lighting, Clouds and Sun and Moon tabs and options defined in Fix Sky Environment – Sky. If the frame frame is on the water track,the environment edit area will display the water options defined in Fixed Environment – Water. Clicking on a specific frame will open its settings in the environment edit area of the panel below the Track editor. Individual frames can be added to, or removed from, a track as required. Note that by default, the water and ground track must have at least one frame each, and the Ground track for any newly-created Day Cycle will initially have eight frames associated with it. The Sky 2-Sky 4 tracks do not require any frames to be associated with them if they are not being used. The idea is that when applied to a region or parcel, the track is played by the system, which blends the frames together to show the motion of the sun / moon across the sky, the changing flow of the clouds and atmospheric colour and effects, the changing appearance of Linden water, etc) as the day cycle is played in accordance with the defined length of day. Moving the yellow point over a blank space in the track timeline and then clicking the Add Sky / Water button to the right of the track editor. Pointing to a blank space in the track timeline and double-clicking the left mouse button. Use Shift-Drag (left mouse button) to drag a duplicate of an existing frame to a new location. Note: when using either (1.) or (2.) above, the new frame will be the blended version of the frames on either side of it (so if a new frame is added half-way between frames A and B, it will 50% of A + 50% of B, for example). Left-click on the frame to be moved and drag it to its new position on the track timeline. Click on a frame to be deleted to position the yellow pointer over it. Click on the Delete Sky / Water button to the right of the track editor. The frame is deleted – no warning is given or confirmation requested. Position the yellow indicator directly over the required frame. Click the Load Water / Sky button to the right of the track editor to display the Select Settings picker (this will only display the valid asset type – sky or water) that can be loaded). Locate and click on the required asset to highlight it. The asset’s environment settings are loaded into the frame, and displayed in the environment edit area of the Day Cycle panel. Position the yellow indicator over a blank point in the track timeline where you wish to create a frame. Follow steps (ii.) through (iv) above. A new frame will be created at the indicated point in the track timeline and asset’s environment settings loaded into it and and displayed in the environment edit area of the Day Cycle panel. Click on the track tab you’d like to clone to. The Clone button will be enabled. Click it to open the Pick: Track panel (shown right). Click the radio button next to the required track name (e.g. Ground), then click OK. The track will be cloned into the current track. Click on the required track tab to select it. Click the Load From button. The Pick: Select Track panel. The panel will display a list of available folders containing day cycle assets in your inventory (this may only be the Settings folder and the Library). Locate the day asset you wish to load and click on it to highlight it. If there is more than one track defined in the selected day cycle, use the drop-down list at the bottom of the picker to select which specific track from that cycle you wish to load into the current track (shown highlighted on the right). Click OK. The settings from the selected cycle (and track, if applicable) will be loaded into the current track, overwriting and frames already there. This button clears all frames in the current track. No confirmation is required, and this action cannot be undone. Use this buttons to play a track. or set the position of the track indicator. Create / edit a day cycle asset. Select the track you wish to set-up (water or one of the sky tracks). Select a frame in the track (or create a frame) and use the edit options. For example, if you are editing a sky track, use the Atmosphere & Lighting, Clouds, and Sun & Moon tabs to set the desired light, clouds, sun / moon position (and textures, if required) for that point in the day, and as defined in Fix Sky Environment – Sky. Select or create the next frame in the track and use the edit options to adjust that frame as per (3.) above. For example, if you are editing a sky track you might adjust the atmosphere and lighting to reflect a different time of day, move the sun / moon to match, alter the cloud coverage, etc. Note the system will attempt to extrapolate the required movement of the sun / moon between two given frames so that any implied motion is relatively smooth and logical. Repeat for all required frames for the track. Use the playback buttons to play your track and check the motion of the sun, moon and clouds, to observe the lighting changes, etc., and make sure it is working as you’d like. Make adjustments to specific frames as required. Make sure you SAVE the cycle. Repeat the above steps for any other sky tracks you wish to include in the Day Cycle. If only one sky track is defined, it will be applied at all altitudes in the region / parcel. If you prefer not to set a water track, the default system settings for linden water will be used. You do not have to create a day cycle to your region / parcel; if you prefer you can use a fixed sky asset.